Glittered silver monogram cake topper adds to the elegance of this simple 3-tiered wedding cake. 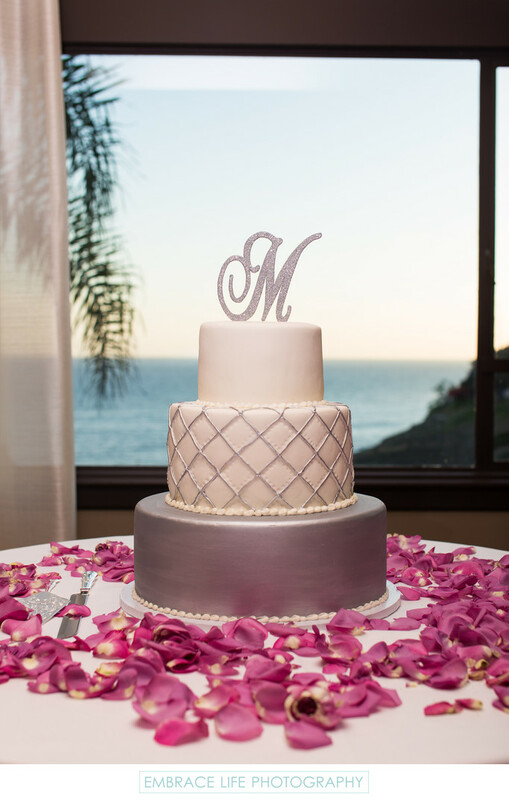 This cake with a silver layer, white with silver lattice middle layer and a smooth white top layer with beaded trim on white table cloth with lavender rose petals looks amazing against the ocean view from the window of Bel-Air Bay Club's indoor reception space. Keywords: Details (1125), Flowers (471), Food and Drink (150), Reception (396), Wedding (1437).